“Fight the real enemy”. This couple were part of a protest against the Brexit vote in Berlin, Germany. The protesters were Britons living there. The current situation with regard to Brexit presents Jeremy Corbyn and the British Labour Party with a significant opportunity to launch a fresh campaign based upon socialist and internationalist principles. The Tory Party has been endeavouring to supplant class politics with petty English nationalism, xenophobia and nostalgia for empire. Despite the minor policy differences on Brexit amongst the political representatives of the capitalist class, what unites them with hoops of steel is their belief in the Tory Party’s inherent right to rule and an obsessive determination to keep the Labour Party out of Number 10, Dowling Street. These are the essential truths about the political farce being played out at Westminster. A closed factory in Britain. Leaving the EU won’t bring it back to life. Unfortunately, many workers throughout Britain, particularly in the Midlands and the North West, became swept up in this EU Referendum maelstrom, because of their opposition to austerity and de-industrialisation. 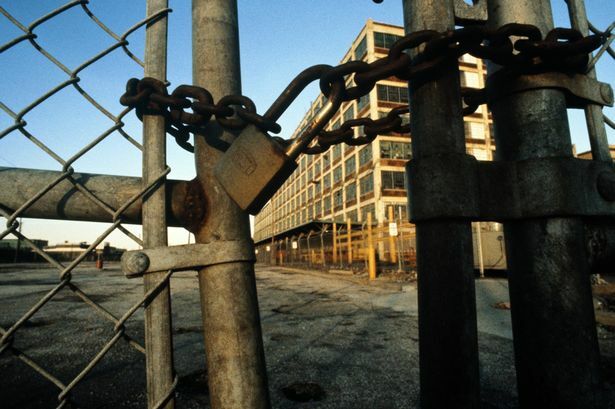 Between 1978 and 2008 some four million UK manufacturing jobs were lost. Although new jobs were provided in the service sector, these were distributed around London and other metropolitan centres, leaving traditional manufacturing areas such as the Midlands and the North devastated. But, leaving the EU will not bring manufacturing industry back to the Midlands. Nor will it bring ship-building back to the North East, or coal-mining back to Wales. The Tories know all this. If Britain leaves the EU, employers will seize the opportunity to try to row-back on improvements in working conditions that have been achieved through trade union action across Europe. Likewise, reforms in health and safety at work will come under attack. As will food safety and the environment. Wages will fall and working-class communities will pay a big price, as social supports and regional development come under sustained attack. The principal division in society is between capitalists and workers, not ‘remainers’ and ‘brexiteers’. I wonder how those revolutionary founders of the Second International in 1889 would react if told that Britain’s labour leaders today have adopted a new lexicon, using terms like ‘hard brexit’, ‘soft brexit’, ‘hard border’, ‘soft border’, ‘customs union’ and ‘backstop’ as defining issues in our class-divided society! 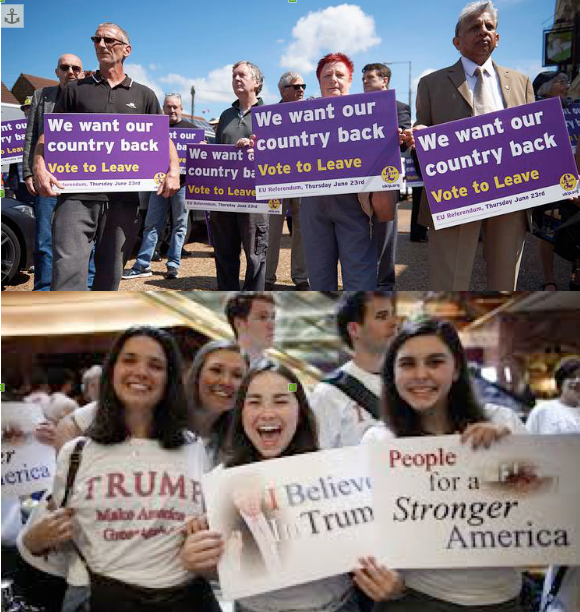 Supporters of Brexit (top) and of Trump (bottom). These are the forces that will be strengthened by Brexit. If the UK leaves the European Union that will be a significant victory for right-wing forces throughout the country. And, it is not just in Britain where reaction will be strengthened. In France, Italy, Germany, Hungary, the Netherlands and many ex-Stalinist countries right-wing parties will proclaim Britain’s withdrawal as a vindication of their position. Right-wing nationalist and anti-immigration forces will advance with renewed confidence. In the United States too there will be allied celebrations. Trump has for a long time proclaimed his wish to see to break-up of the European Union. Shortly after his inauguration he invited Nigel Farage to the White House where he received a big welcome. Right-wing forces across Europe are united in their endeavour to shatter Socialist and Labour Parties. LePen looks to Brexit as her inspiration while she pursues a similar process in France; likewise, in Italy, Poland, Germany and other countries. Steve Bannon has spoken at anti-EU meetings in Europe; Nigel Farage addressed a similar meeting in Dublin. Rees Mogg recently went to Northern Ireland to speak at a DUP event. Yet, while the right is organising a common front against workers’ unity and democratic rights, the leaders of labour in Britain appear to be unable to see beyond the narrow Brexit agenda that is being set for them by the Tories. 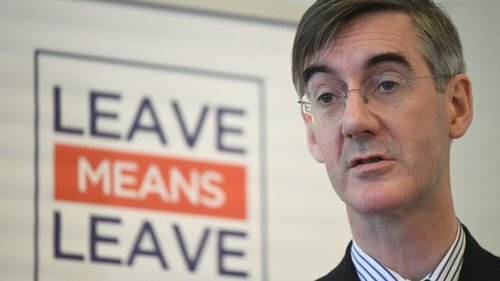 The far right Tories like British Conservative Party hard-liner Jacob Rees-Mogg are the ones who are pushing Brexit. The origins of Brexit lie in nationalist and imperial ambitions within the Tory Party. From the very outset the campaign to leave the European Union was an endeavour by right-wing Tories to divert the anger and alienation of working-class communities into nationalist and anti-immigrant channels. Similar processes are taking place in the United States, France and other countries. Undoubtedly, disillusionment with the leadership of the European Union played a part in the 2016 Referendum result, but the defining feature of the anti-EU campaign is the attempt to place the responsibility for falling living standards and the collapse and alienation of working-class communities at the door of the EU. Immigration policy was also elevated by Farage and others in order to strengthen the ‘No’ vote. Jeremy Corbyn, though a very popular figure amongst socialists and youth, has been making a series of major blunders on the EU question. He engaged in discussions with the Democratic Unionist Party, a freakish rag-bag of conservatives, sectarians, biblical zealots and creationists, while seeking an alliance against Teresa May. He claims that, as a negotiator, he could win a better deal at EU level than the Tories, as though these matters are decided by round-table discussions rather than by the balance of class forces. He says he favours remaining within the EU Customs Union and maintaining a close relationship with the EU Single Market – two of the most significant features of the EU. So why then leave the EU at all! Opposition to the ‘free movement of people’, which is allowed under the conditions of the Single Market, has become the new euphemism for anti-immigration policy. Jeremy Corbyn says that he wants guarantees that progressive legislation on workers’ rights, which was won through trade union action across Europe, will be maintained after Brexit; he has these guarantees now within the EU. And most significantly, he is rightly calling for a new general election – the last one was less than two years ago – so that voters can change their minds and replace the Tories with a Labour Government, yet he will not clearly and openly support a move that would facilitate a similar change of mind on the issue of Brexit. The reality is that Jeremy Corbyn has been tossed around like a flimsy barque on a raging sea, completely unable to control his trajectory, or even to identify his destination. Though quite late in the day, it is nevertheless essential that the leaders of the labour movement now identify the essential forces that are at work around the Brexit question and extricate themselves from the false dilemma in which they have become entangled. The terms ‘remainers’ and ‘brexiteers’ are largely meaningless and should be dropped entirely by socialists. They only serve to confuse and obfuscate. 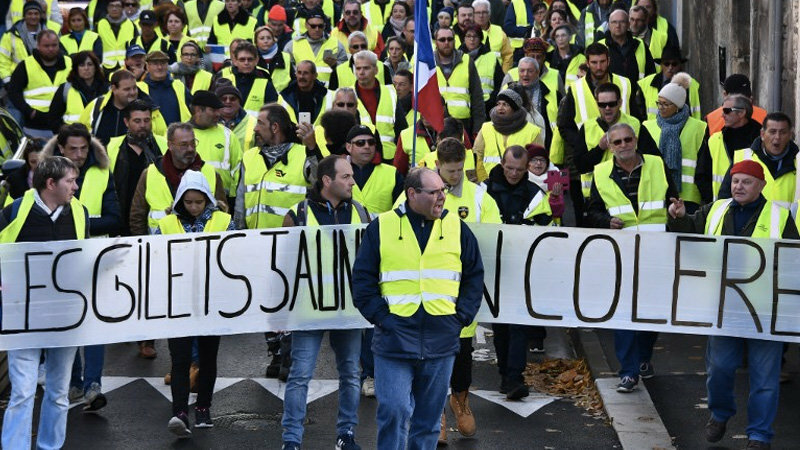 With the French working class moving into mass struggle, leading to what might even become a pre-revolutionary crisis, now is NOT the time for the British working class to isolate itself from their sisters and brothers across the Channel. Now that it is clear what Brexit would represent in practice, Labour must do battle again, but this time with the clear perspective of delivering a blow to the Tories and other right-wing forces in Britain and throughout the EU. The British labour movement must make common cause with socialist and trade union forces across the EU for a range of demands to combat austerity and for an enhancement of workers’ rights and living standards. Those conservative and right-wing governments that proliferate in Europe must be opposed in a common endeavour across all countries. It is contrary to the best traditions of the internationalism that one country would just drop out of the general struggle and let the workers of other countries just fend for themselves. The Referendum result of 2016 was not at all definitive. Many complex processes were at play during the vote. Scotland voted 62% to 38% to remain within the EU. Northern Ireland voted 55.5% to 44.5% to remain. Wales voted 52.5% to 47.5% to leave. England voted 56.5% to 43.5% to leave. Only 72% of registered UK voters turned out in the Referendum. The 52% that voted to leave therefore represented only 37% of the electorate. There was a three to one majority amongst voters under 24 to remain. There was also a majority amongst voters between 25 and 50 to remain. There is nothing undemocratic about asking that the question be considered again. On the contrary. Now that a considerable body of new information on the issue has emerged, and now that the lies of Farage, Johnson and others have been exposed, it would be profoundly undemocratic not to have a second vote. On a global scale forces on the right are salivating at the prospect of Britain leaving the UK. The consequent rise in nationalism and anti-emigrant feeling will provide nutrient to these forces for many years. It is essential that battle now be enjoined afresh. It is never too late. The EU is an unreformable corporate club that has just made clear its support for a right-wing coup in Venezuela. It has the only constitution in the world that has effectively outlawed Socialism with its rules on competition and procurement. It’s a racist institution that keeps Africa in poverty with its policy of dumping foodstuffs there to keep prices in Europe artificially inflated, thereby putting African farmers out of business. Support for the EU is support for neoliberalism. Being anti-EU does not mean being anti-European. Globalisation is not internationalism. The sooner the Left gets to grips with these basic concepts, the sooner it will be taken seriously. Here is a perfect example of how general truisms abstracted from the concrete reality lead to completely mistaken practical conclusions. The actual reality is that every single capitalist government in the world is wedded to the exact policies that Pete Rose correctly condemns. The reason is that international capital demands that. Does Pete Rose seriously think that a Britain outside the EU would be able to do anything different? Even a left Labour government would swiftly be brought to heel by international capital if it tried to reverse these policies. 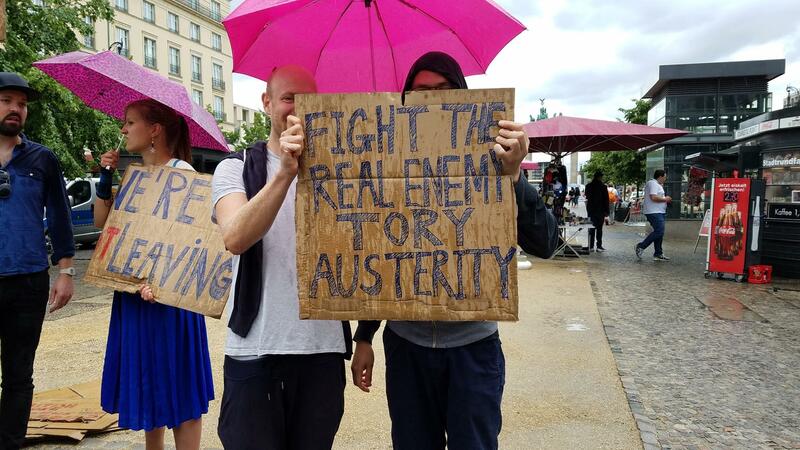 And the British working class – just like their sisters and brothers in every single capitalist country in the world – is powerless to reverse this direction if it fights on a national basis. The alternative is international working class solidarity, not the British working class aligning itself with a wing of the British capitalist class, on which the entire Brexit campaign is predicated. But by removing itself from the EU, British workers are distancing themselves from exactly that course. Were the British workers put in a left Labour government and were that government to violate EU rules by renationalizing and were the British then threatened with expulsion by the EU, that would bring the working class of the entire region together in struggle. What the “left” advocates of Brexit advocate is a non-starter as far as international working class solidarity in action is concerned. But a “left Labour government” wouldn’t be supporting a right wing coup in Venezuela nor would it be advocating a change in our laws to ensure corporate entities could ride roughshod over our public services. Left wing opposition to the EU and it’s forebears predates the tiny amount of nationalists who also oppose it. Again, internationalism and globalisation are two different things. Something the middle class has difficulty grasping. As for the “middle class”: I don’t know who Pete Rose is referring to. As for myself, I’m a retired construction worker, but I most definitely have seen huge swaths of the petit bourgeois left here fall into that red-brown alliance. That’s for sure.